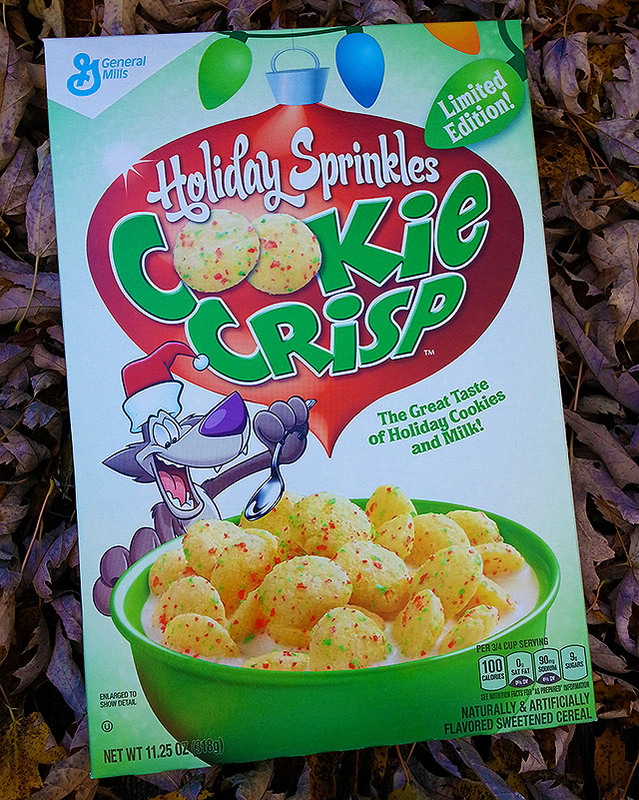 Holiday Sprinkles Cookie Crisp Cereal! | Dinosaur Dracula! Perhaps inspired by their success during the Halloween season, General Mills is finally trying to muscle in on Christmas. And I’m totally good with that. 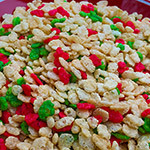 The first of two super seasonal cereals (I’ll cover the second in a future post) is Holiday Sprinkles Cookie Crisp. This is huge news! Cookie Crisp hasn’t danced with Santa since 1991’s Christmas Cookie Crisp, when the brand was still owned by Ralston. 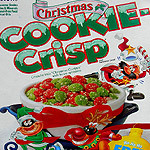 It’s been more than twenty years since we’ve been given a rock solid reason to correlate Cookie Crisp with the holidays. Our prayers have been answered! Okay, the cereal. It’s phenomenal. Really and truly phenomenal. Even regular Cookie Crisp is conceptually one of the best cereals of all time, because who wouldn’t be down with a bowl of what’s essentially tiny cookies? Here it’s even better, because they’re Christmas cookies. Total, absolute Christmas sugar cookies. Same color, same shape, same stupid sprinkles. And guess what? 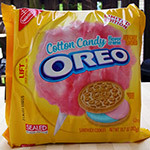 They taste just like those sugar cookies, too! 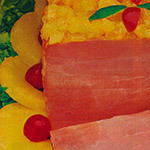 The texture is different, obviously, but the flavor is completely on the mark. The timing is just perfect. I’m a forever-fan of Christmas Crunch, but since Quaker hasn’t updated the box art in several years, it’s starting to feel old hat. The annual revisions to the box art were such a huge part of the appeal. Well, here comes General Mills to save the day! 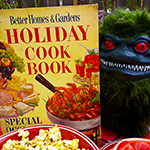 Fourth quarter breakfasts may once again pop with holiday magic. 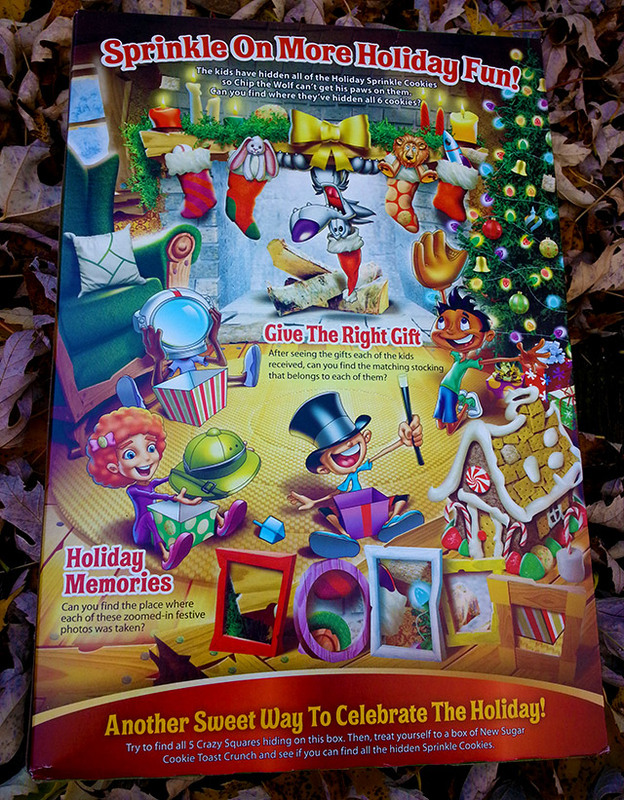 The back of the box is covered with cute and easy puzzles. I would’ve preferred a tutorial on how to transform Holiday Sprinkles Cookie Crisp into festive cereal bars, but in a pinch, this’ll do. Cereal just isn’t as good when its box doesn’t double as reading material. The scale of Cookie Crisp has always delighted me. 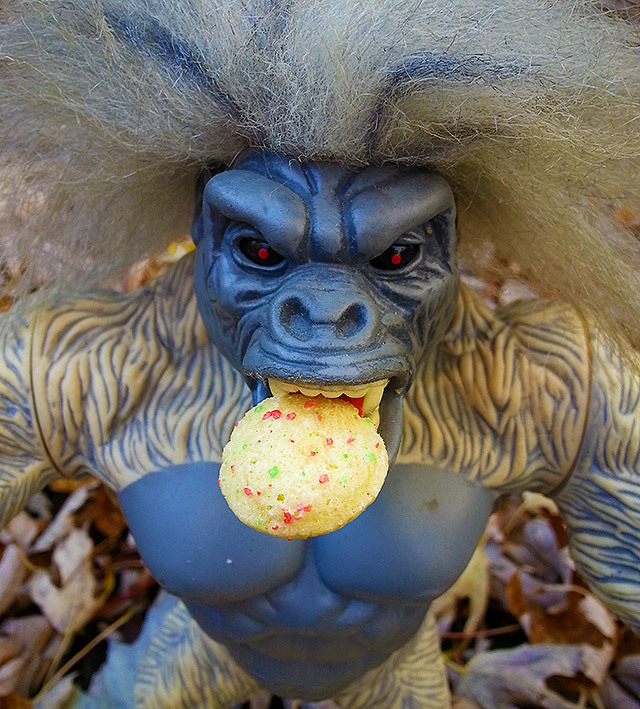 It works perfectly if you want certain action figures to look like they’re eating legit cookies. Alternatively, you can pretend that you yourself grew as tall as a tree. Buying Cookie Crisp for the first time in so many years reminded me of another childhood joy, too. 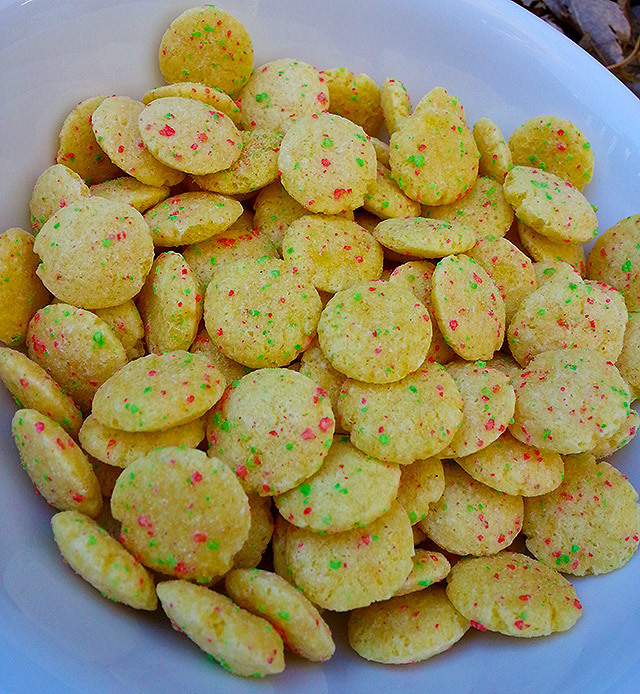 I can’t be the only one who used to bite each piece like it was a real cookie. I’d gently eat the pieces in chunks, swallowing approximately half a gram’s worth of Cookie Crisp at a time. It extended breakfast well into lunch, and as it turns out, that’s just as much fun to do in 2014. Big thumbs up for this Cookie Crisp. 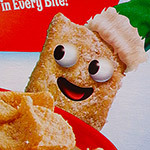 Stay tuned for my review of the other new General Mills holiday cereal — Sugar Cookie Toast Crunch!